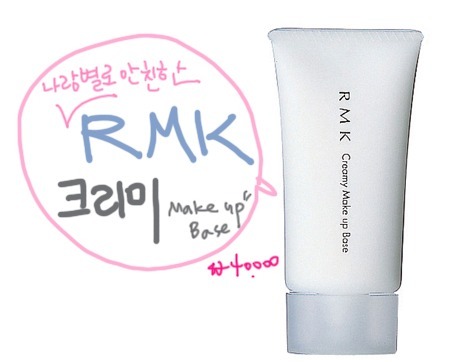 Recommended Makeup base for oily and combination skin! People who are in worry because their face is too oily and the makeup disappears past noon this is a review for you. This isn’t so perfect product however on the magazines it is the it item and many makeup artist know about and like to use this product. It is good to use. First of all the formula is muse type and every time I use, it’s refreshing. It settles very well onto the skin and fresh up the skin. On the commercial it emphasizes on the persistence and it really works well. There are beige and pink color to choose but I choose pink color. This is perfect item for oily skin who gets to have no makeup left as time goes by. It really helps the makeup to settle and holds on tightly as well lessens the darkening. People who tend to get darkening by noon are really helpful to apply under the foundation and really helps the skin to look healthy and be fresh again. It’s not too glossy but gives very soft and smooth surface. It evens out the skin tone expect lack on the coverage!!!!!!!!!!!!!!!!!!!!!!!!!! Also this product is really good on covering large pores. I don't have problem on pores but it works well. It’s not like magically covering the pores perfectly but hardly can see it from far away. So its like covering regular size of pores seen from the oily skin. 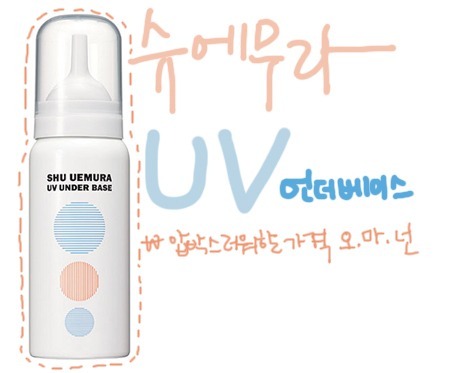 Even for combination skin type would be satisfy using the Shu Uemura UV Under base. I received it as a present and used it for 2 weeks and give it away to my friend. She had combination skin type and it was perfect for her. The reason is that there is less oil so holds the greasy parts on the face. It’s not a shimmer product but there are some neat glitters that when you apply to your face, it brings up the skin tone and no feeling of dryness.